Today, we are showing off our very cool My Square Meal box, made even cooler by the fact that it's a Dallas company founded by two moms! F&B and I are loving trying it out, I'll have more to share soon after we've tried it a few times. But for now, check out the cuteness of all the little fixed compartments! They are molded into the container, so juice from the honeydew can't leak through to the sandwich in the next compartment. There is definitely a selling point to not having to arrange silicone cups so messy stuff doesn't touch dry stuff. Faith has a turkey & cheddar sub made on a Nature's Own 100% Whole Wheat Hot Dog bun. We had sausages the other night and the leftover buns are great for sandwiches, especially since we don't have enough left to be another meal. 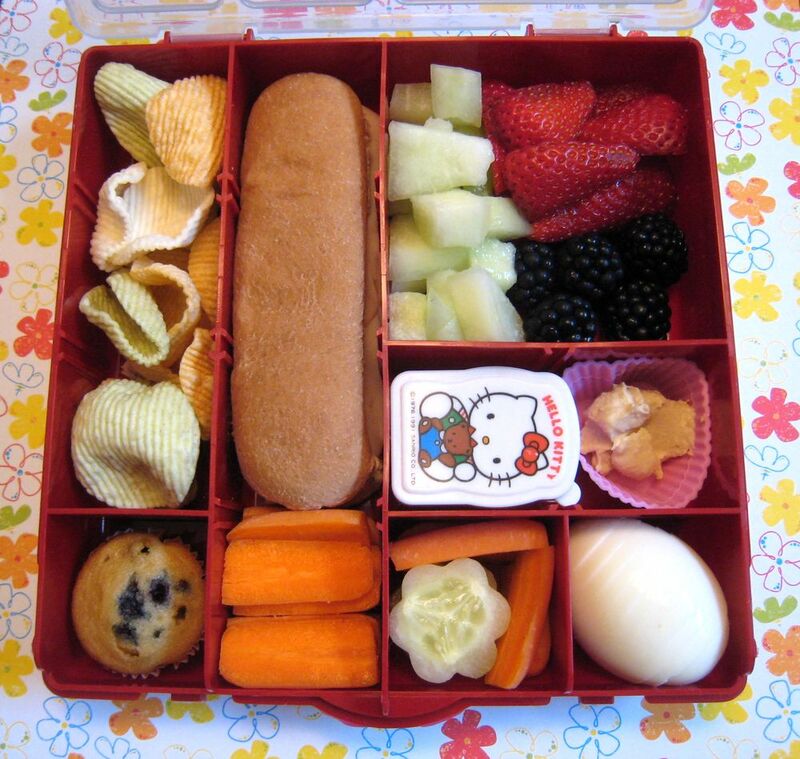 She has veggie baked chips from Sprouts (love these), a blueberry muffin, carrots, cucumber, a sliced boiled egg, ranch in the Hello Kitty container, hummus in the pink heart cup, blackberries, strawberries and honeydew. great box! looks pretty big though. Just measured it, it's slightly under 8x8inches square, about 2 inches deep. I think you can tip it on its side, but I'm not 100% sure. oh boy - another box I think I have to have!!!!! I like the look of this box! I checked out their site but couldn't find a price are they not selling it online? Thanks for the giving the size. I'm teaching toddlers at a MDO/preschool this year. I may be giving out your blog addy to give parents ideas for lunch. I think they are, but I will try to find you the link for it. I know locally where you can buy it, but all the stores are in Dallas only. Thank you for all of your excitement and positive comments about the My Square Meal lunch box. I am one of the "Lunch Ladies" who created this product and would like to answer some of your questions and concerns. We are local Dallas moms, and we are also former teachers so we knew what would make lunch for our kids easier, healthier, and greener before we started packing lunches. 1. It is big enough for adults and small enough for kids. No need to stuff it full of food that you know your child won't be able to eat. I usually fill one box with a little note from me to my child. It will definitely grow with them. 2. Since kids only have to open one container, they are able to spend more time enjoying their lunch and less time opening packages and containers to figure out what their lunch options are. 3. Bento boxes are $9.95. We also have really cute oil cloth lunch boxes that the bentos fit in. The entire set is either $34.95 or $39.95 depending on the style. 4. We have a new website that is MUCH more user friendly than our last. I hope you will check it out. 5. You can purchase My Square Meal on our website or at a variety of stores in Texas, Georgia, Montana, and Oklahoma. There is a page on our website with the list. Locally, they are available at Learning Express Dallas, Plano, and Frisco. They are also available at Kid Biz in Dallas. Also, we have a contest going on right now. Send info@mysquaremeal.com a picture and description of a lunch you have packed in a My Square Meal. Entries will be judged by adults and children. The winner will be posted on our site and will receive a free lunch box of your choice! Start Packing!!! !